Euphoric excitement in Bonn last week: With six “Clusters of Excellence” to receive funding under the Excellence Strategy of the German federal and state governments, the University of Bonn is the most successful university in Germany. In total, 57 cluster initiatives received funding commitments of up to ten million euros per year for an initial period of seven years. The cluster “ECONtribute: Markets and Public Policy” – a joint initiative of the Universities of Bonn and Cologne, briq, and the MPI Collective Goods – is the only predominantly economics-focused application that made it into the second round of the Excellence Strategy. How do you measure and deal with market power in the digital age when many offers are virtually free of charge but paid for by the provision of data? What are the consequences for consumer protection? How do preferences for fairness or justice influence the design of minimum wages or inheritance taxes? Can (and should) individuals be “nudged” into behavior to their own benefit? 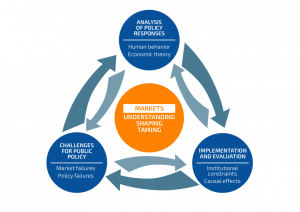 “Our research at briq on the foundations of decision-making, behavioral applications to public and labor economics, the study of discrimination and the malleability of moral behavior perfectly fit the cluster’s research plan. We look forward to contributing our expertise,” said Armin Falk.